Welcome to another Literary Lords and Ladies episode. This week we hosted Saddiq Dzukogi in our tweet chat series on Twitter. 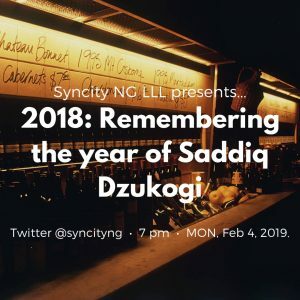 Last year was the year of the Saddiq, and we were honored to have him reminisce on his journey with us. The #SyncityNGLLL show is an avenue that celebrates African creatives on the continent and in the diaspora. 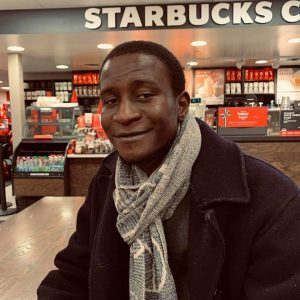 As usual, we’ve compiled the transcript of our conversation with Saddiq for you to catch up on if you missed it or you want to relive it. Cheers! 2018 was quite the year for you. I saw and read you everywhere. Was there any deliberate strategy to spread yourself thin last year? I didn’t have any strategy other than the usual: to write poems and to try and share the words with people who will allow me to have the privilege of their listening ears. I was lucky to be invited to places and I went and did the thing I love the most. So there were no tactics or gimmicks to make you appear in as many places as possible? It is out of my hand. I love to think this is not the case for some writers. But what I do is write poems and write more poems, with the hope that people who like what I do invite me to share with their platforms my creation. Speaking of 2018, can you discuss with us how memorable the year was for you? Someone may need that spark to get going tonight. 2018 was a year that was painful because it was the year I started thick in loss of a daughter, Baha. In all honesty, it’s a year that I do not want to describe as memorable, only as a year of mourning and grief and sadness and toil and more toil. But again, I’ll say I used the process of writing poems to navigate grief, trying to make sense of it by way of the poems. I felt pulled away from the world, into an alternate world in the poems I created. In there, I was with my child, crying, living and reliving. My condolences on your loss. I watched you perform at Ake Festival. It was a powerful tribute to her and there was no dry eye in sight. Would you say creatives create better pieces when wrapped in the cloak of sadness or grief? I can not speak about others. But this for me wasn’t a creative process so to say. I was only trying to find the language to articulate my grief. I was only finding words that will transcend realms and reach the child that was lost because I had a lot to say to her. May Allah grant you the grace to soldier on even in her absence. Let’s talk ‘writing tips’. What are the things you think constitute good poetry? Write your heart out. Turn the soul of anything you want to write about inside out, and write what you see like your life depends on it. Write what you want and trust your instincts, but more than anything, trust good books. They are the best teachers. @ese_harrison: What is your writing process like? Do you have any ‘writing rituals’? Not really. I try to write every day. I try to learn every day. Try to read every day. I write the poems, try to see what works and what doesn’t. Share with a few friends I trust. Get feedback. Read people who have written similar work. Revise. Revise. @mystiquesynn: Would you advice serious poets to write on social media or just submit to journals like you do? How best can a poet get exposure and get invited to these events/residencies? The best thing is to know your readers and how best to reach them. All these are just platforms and media of reaching the target. The poet has to define what’s the best way for them. For residencies, you apply and apply and apply. It’s a game of persistence. There is one question I have always wanted to ask you, Saddiq. Is everyone in your house a writer? The Dzukogi family is quite popular in the literary space. Oh boy! We don’t have variety. So that’s sad, no? All writers? The Dzukogi family is a story waiting to happen! I’m sure you all read Sylvia P. all day and quote Shakespeare. Time is far spent! How time flies when you are having fun. Just before we call it a night, please give up-and-coming poets some practical tips to get to where you are. They can catch up really quick because I haven’t gone far. Writers need to write and write and refuse distractions and write some more. A writer is never comfortable with what they know because there is always another world ready for exploration. So explore! Thank you so much Saddiq Dzukogi for joining us today despite your busy schedule. We appreciate it. How can we purchase your books? Links, please? You can get Inside the Flower Room by Saddiq Dzukogi at Ouida Books and AMAB bookshop in Minna. You can also order the full APBF box set here. From all of us at Syncity NG, we thank you. Don’t forget to submit to our forthcoming anthology and apply for our competition. I remain your Chief Synner @mystiquesynn! Follow us on Twitter and see you next week!